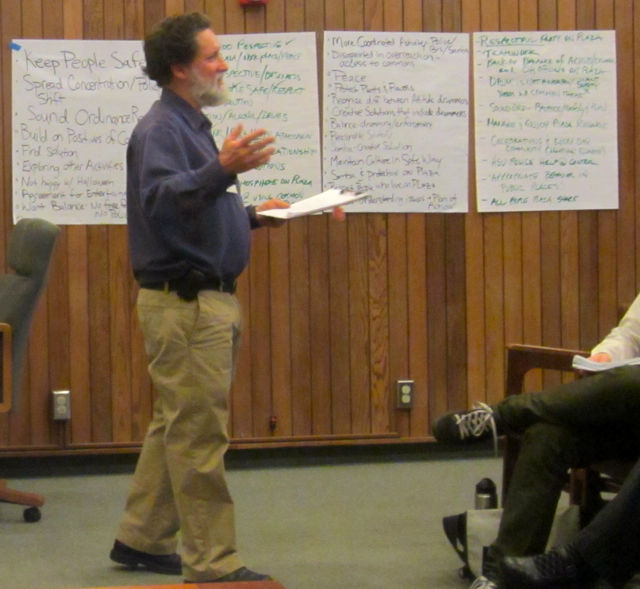 Note: Humboldt Mediation Services has released its compilation of ideas aired at last week’s Plaza scoping session on how to abate excessive behavior on Halloween and New Year’s Eve. These include initial thoughts of attendees – responses to “What would you like to see accomplished by this meeting?” reports from the five subcommittees and a synopsis of ideas expressed at the Jan. 24 meeting. – Ed. *Solutions regarding Arcata Plaza use need to include a ‘BIG PICTURE’ perspective—multiple avenues of use need to be addressed and problem-solved. Study Group’—Robyn Paschall from the Samba People will take responsibility for getting the info from our large meeting to participants—The Arcata Eye will be publishing information from the large group. Future meetings to be announced!! Volunteers collect glass bottles, other projectiles, etc. Safe-comfort-space Specialize/focus, small groups, consolidate. This entry was posted on Wednesday, February 1st, 2012 at 2:49 pm	and is filed under News, Community. You can follow any responses to this entry through the RSS 2.0 feed.